Laydy Jams will finally release a long due debut EP. With the amazing talented Gents , we have created a fresh new live sound of some of your favorite tunes , new ones and more to come. This is only the beginning. It will be our first official show for 2017 and we hope to see all your beautiful faces in the crowd. Laydy Jams is a collective of 3 women of colour, who create music together using their various talents. Laydy Jams features Missy D as female emcee, Roya Bennett on vocals and beatbox, and Sejal on violin and vocals. Our trio bring each of our talents together to create a unique sound, with R&B, Hip-Hop, Jazz, Soul, Classical, and Funk roots. Our music and message is impacted by our diverse cultural backgrounds, with influences hailing from the West Indies, Middle East, South Asia, Europe, North and South America, and Africa. 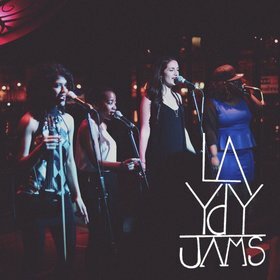 Laydy Jams seeks to use our music to empower youth, women, and challenges the themes often used in popular music and society. Our goal is to exemplify the rich contribution that women of colour can make to music. We write our life experiences into music, knowing that we provide a kind of comfort, familiarity, and joy for other people of colour and marginalized communities; providing hope, home, and love.